Hyundai Australia will sell the high-performance i30 N hatchback with a track-friendly warranty, according to our colleagues at Australia’s Wheels, who report that buyers of Hyundai’s hot hatchback won’t void their warranty by taking it to the track provided the events are noncompetitive. In other words, taking an i30 N to a track day won’t void the factory warranty, but entering it in a race will. While we Yanks won’t receive the i30 N, Hyundai is sending us the mechanically similar Veloster N. Powered by a turbocharged 2.0-liter inline-four with up to 275 horsepower and 260 lb-ft of torque, the Veloster N, with a six-speed manual transmission, will go up against high-performance hatchbacks such as the Honda Civic Type R and the Volkswagen Golf R.
Whether the Veloster N comes with a track-compatible warranty remains to be seen, however. A spokesperson for Hyundai acknowledged such a warranty is something the company is discussing internally as specifications and pricing for the U.S.-spec Veloster N are finalized. Hyundai has been well known for its long warranty coverage, so opting to introduce the Veloster N with a track-friendly warranty seems like a logical step as it attempts to establish its high-performance bona fides. 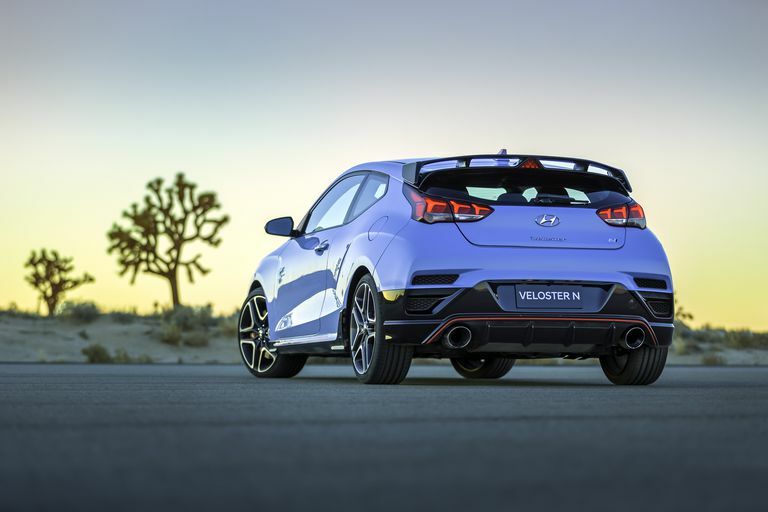 We’ll know more about the Veloster N’s warranty by time the model launches later this year.